This little flower, Speedwell, was in abundance yesterday along the verges as we walked the forest trail back to the road. It is a fairly common, low growing plant and has bright blue flowers with a white centre. The flowers are 4 lobed with the smallest lobe being lowest. The stalks have two opposite lines of hairs running a long their length. The leaves are pointed, oval toothed and grow opposite each other along the stem. It is a native perennial plant that blooms from May to July and belongs to the Scrophulariaceae family. 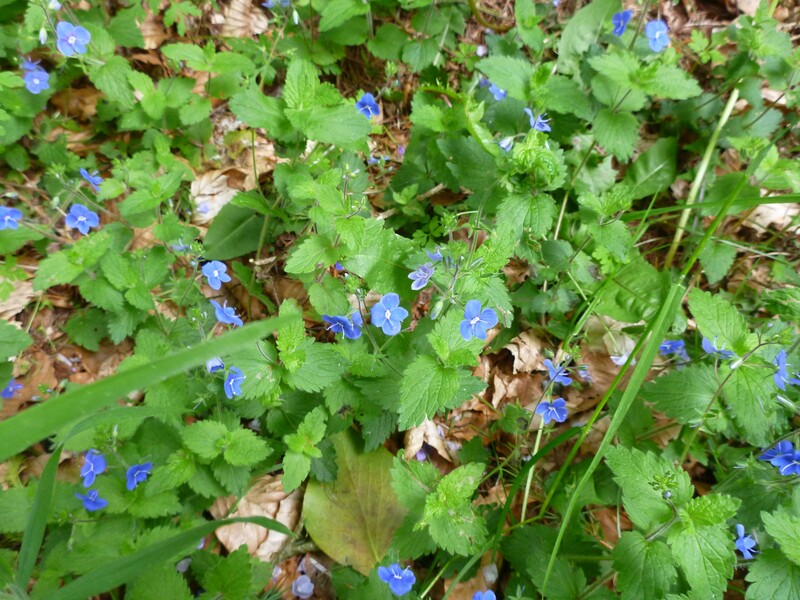 There are 7 varieties including Germander, Wood, Heath, Wall, Thyme- leaved, Slender and Ivy- leaved, we think this was Germander as the flowers are more blue than lilac in colour. Interestingly, one of the two smaller ships that set sail with the Mayflower carrying the Pilgrim Fathers was called the Speedwell. Twice the ships set sail for America and twice had to return to England as the Speedwell was found to be leaking. It was later discovered that the crew not wanting to be away from home for so long had sabotaged the ship.